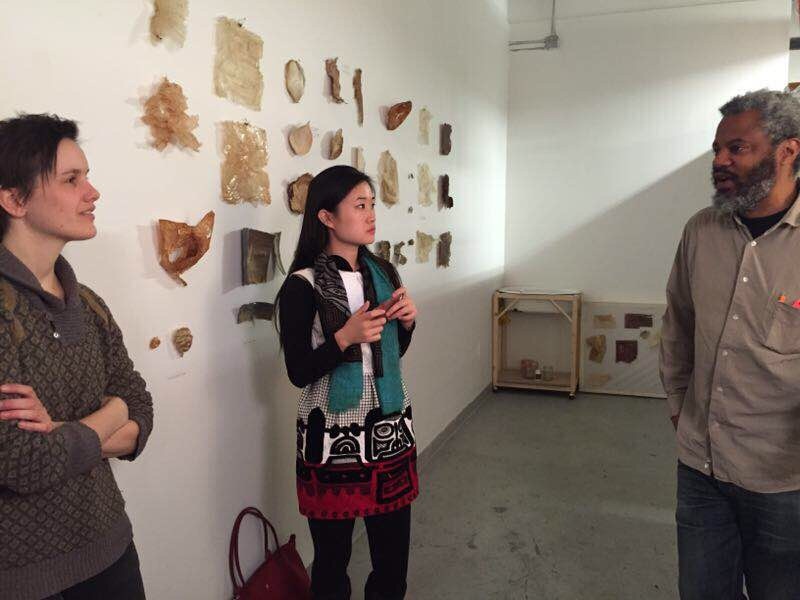 Yiqing Li and Hamza Walker with Jessica Simmons in her studio. One hundred and three artists, three curatorial teams—how do we develop conversations to create a show that is uniquely meaningful for each participating artist? As a graduate curatorial assistant, I believe two qualities are very important for this work: responsibility and creativity. The curatorial teams understand very well that the MFA Show can be a moment when many artists initiate their post-school professional careers. With this consciousness in mind, our curatorial team took on the MFA Show process. Studio visits play an essential role in the overall project. This year, we began studio visit early—November and December—in order to allow more time to become familiar with our artists and their practices. We hope to establish relationships based on mutual trust between the curatorial team and the artists. For me, studio visits are fascinating and valuable experiences. Standing in artists’ studios and looking at their work and the various materials within their studio, I started to gain insights before we even started our conversation. A studio’s layout gave me the first feeling of an artist—some small drafts and drawings on the walls, some art materials orderly or disorderly placed on the floor. But as we started to talk together, my understanding of the work became much deeper. It is always interesting to know why and in what situation an artwork is created. Hamza Walker, the guest curator for my team, asked the artists a variety of questions. His challenging inquiries as well as casual remarks pushed the artists, and myself, into new territories in thinking about the work. It feels that such exchange is undoubtedly important to a process like the MFA Show. I think that figuring out how to unfold a conversation with artists is creative work. We are not there to collect simple information that we can gather from an exchange of emails. We are there to get feelings about their work and to be inspired with ideas of how we might best present their work in the exhibition. I think of our artists as neighbors with whom we meet as often as possible. Our team visited each artist’s studio multiple times, and I greatly enjoyed this continuous and developing dialogue that enabled greater understandings of their working process. This is very important for when we begin to develop the exhibition floor plan. I found that determining the floor plan is also an intensely creative. A given work of art can create different meanings in different contexts. In order to place things together, we consider many factors, including the conceptual relation and visual connections between works, as well as potential benefits or problems. We think about thematic correlations that might allow viewers to think of an idea address expressed by the works through different forms. The process of developing the floor plan is far from easy. A lot of discussions and negotiations are involved. It is during the discussions between teams that our creative ideas are formulated. We also must have certain flexibility to the floor plan to allow for the inevitable revisions and new ideas of the artists for their work. Embracing such changes and making them positive for the show as a whole requires our creative mind and practice. Some of these changes can even lead to more exciting and dynamic moments in the exhibition. Now I’m ready for the next phase: installation, which will have its own moments that require creative practice.